Referee. Born in Dunrae, Lorne "Windy" Lyndon was one of Canada's most renowned officials for 20 years, 1933-1953. He officiated six Allan Cup finals (1936, `37,`46, `47, `49, & `53), Memorial Cup finals from 1950-1952 and the Alexander Cup in 1951. 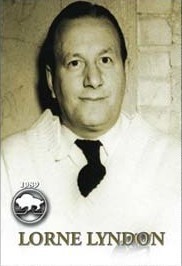 As a player he was a member of Winnipeg's 1932 World Champions and Allan Cup winner in 1931. Lorne was an all-round athlete and was on an all-star soccer team chosen to play against England touring side in 1931. Only the famous Winnipeg Toilers bested his Westbrook basketball team 3 years running.